This 18 room mansion was built in the early 1900s for a local tea merchant is said to be the prototype of the 'House with Figures' in Pasternak's novel, "Dr. Zhivago". The Gribushin family left Russia after the Revolution during which time the building was used as a hospital. 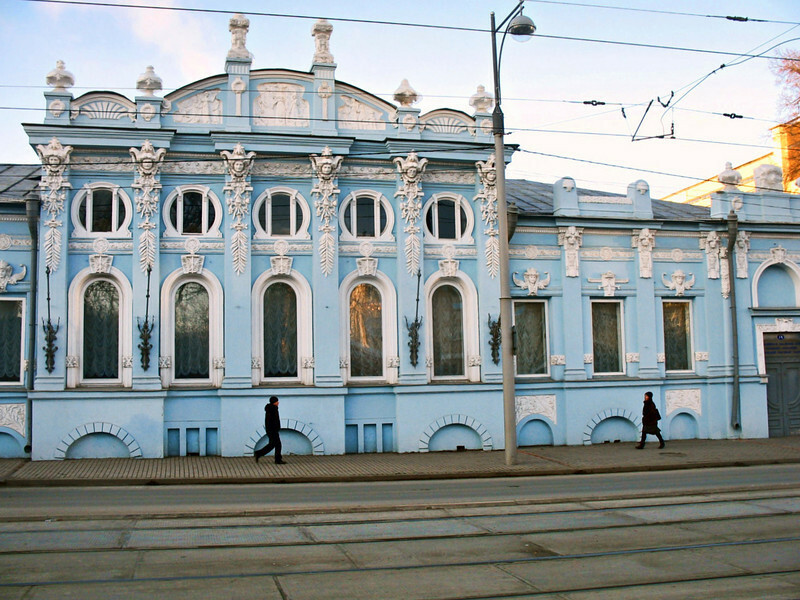 It is now home to the Urals branch of the Russian Academy of Sciences. For those who've been wondering about snow - there basically, isn't any. It's been too cold (-25C) the last few days to snow. Am sure we'll get hit soon though we're hoping it holds off another week until we leave for the States (fingers crossed). Fabulous architecture, yet the street scene looks so cold and barren. Great detail on this building. What a gorgeous capture.............love the pastel blue! I love the light blue tone and intricate details of the statuary on the bldg. Great shot!